You won't regret spending a deserved vacation in this peaceful villa. The exterior is great. There is a spacious terrace on the front of the house to enjoy a good breakfast, and a furnished porch which is perfect for a barbecue. The salted pool sizes 8 x 4 metres, with a 1.4-1.9 metres depth. There are 6 sun loungers at the terrace with two pool umbrellas to sunbathe, as well as an exterior shower bathroom for your comfort. Children will play at the natural garden with different fruit trees. There is a henhouse at the property and the owner takes care of the animals. The best of all is that you can try the eggs. This one storey house features a spacious living room with satellite TV where you can lie and relax on the sofa and a rustic dining room with a fireplace and a TV set to watch something interesting while having a family lunch. The renewed kitchen, despite is size, has everything you need to cook, like a microwave, an electric oven, a fridge and an electric stove. There are two bedrooms with a double bed and a closet each, and one with direct access to the garden. We can prepare a cot and a high chair if you are travelling with a baby. The laundry room is equipped with a washer, an iron and an ironing board. There are also 3 fans available. 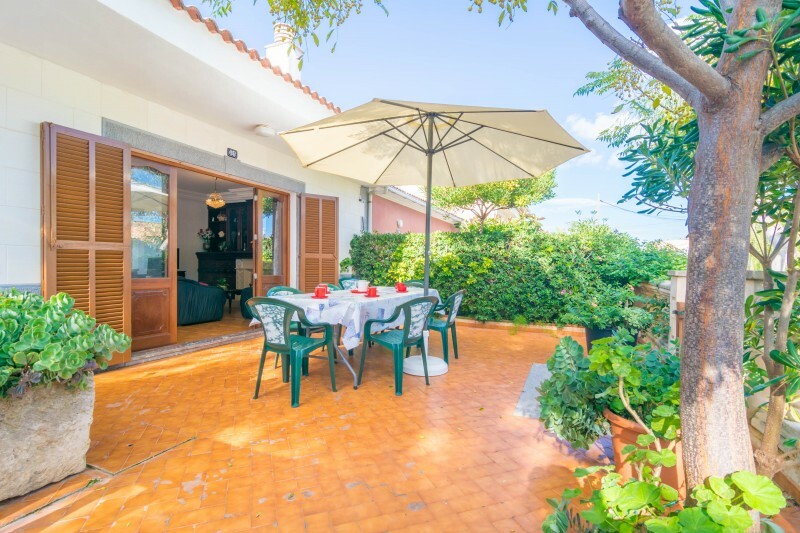 This house is perfect for those searching peace and for the beach lovers since the beach is only 900 metres away. You can have a long walk along the promenade of Can Picafort, have a coffee or a home-made ice-cream. In addition, you can take an excursion boat to Formentor ( every day there are boats in the summer). You will find a wide range of shops in the city centre, as well as bars, restaurants and a children playground. The street market takes place on Fridays. If you son't feel like going to the beach, you can explore other areas or villages like the centre of Alcudia or Pollensa, or viist the Natural Park of S'Albuera, the Caves in Campanet or the water park in Alcudia.